To dream of chirping and/or flying birds, represents joy, harmony, ecstasy, balance, and love. It denotes a sunny outlook in life. You are experiencing spiritual freedom and psychological liberation. It is almost as if a weight has been lifted off your shoulders. Interestingly, the bird in my dream landed on my shoulder. Does that mean I have a new weight on my shoulder? Actually, birds are very light – hardly a weight at all. And, when I was young, we always had parakeets for pets, and I dearly loved them. It was also a blue bird. So, what does Dream Moods have to say about Dream Interpretation Bluebird? 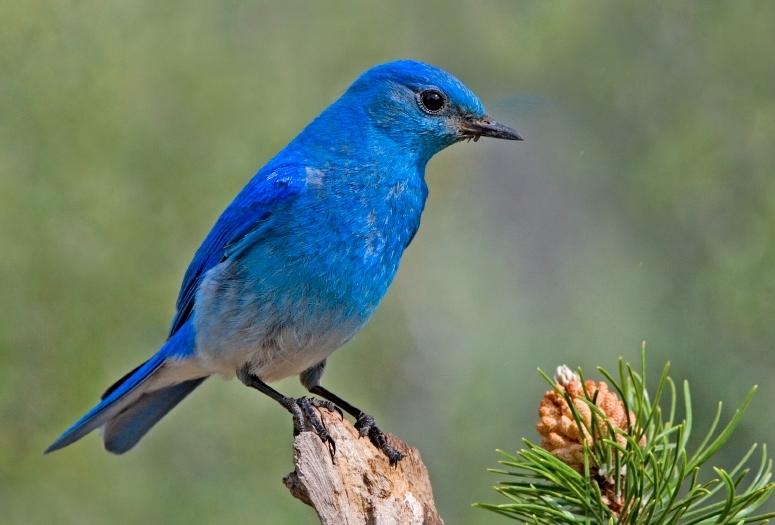 To see a bluebird in your dream, symbolizes both happiness and sadness. It is also an indication of purification and resolution to the opposing conflicts/paradoxes in your life. To see a parakeet in your dream, suggests that a message is being conveyed to you. Perhaps, a message from your unconscious is being transmitted to your conscious mind. To my delight, the bluebird denotes such associations with happiness, that I discovered many “Bluebird of Happiness” poems online. Here’s one I especially liked, by Jan Peerce. Well, I must admit I am working on resolving inner conflicts and I do feel like a weight has been lifted from my shoulders recently. It sounds as if my research into Dream Interpretation Bluebird brought forth some good results. there (there was a child, too….me?) that it was my Grandma Ellen’s (long deceased) favorite bird. I’m 56 and have been feeling very sad, empty, and alone in life. I have a wonderful career teaching, but I divorced 17 years ago after a 17 year marriage and two wonderful children. I had an abusive partner for 12 years and although proud of getting out of the relationship finally, I’m angry that it took 12 years … proud of myself, but disappointed in myself for not having been stronger. Now I have an ambiguous dating relationship. My husband never remarried, and we still see each other with are grown kids. At the bottom of my heart and back of my mind, I want to go “home” and reunite with him. But when in actual company, I feel a fear of being smothered and claustrophobic and stuck. I’m trying to figure this out, because I want the remaining years I have to be joyful!! Hi Karen, thanks for writing, and thanks especially for including information about your life at this time. To begin, in my opinion, because you’re dreaming about such a lovely bird, your dream is showing you there is happiness to be found in your life (in spite of your present life circumstances and your feelings of sadness, emptiness, and aloneness). Your dream bird turns up in an old or ancient place, which could emphasize that your problems are in the past. Plus, the bird is at a beach in Hawaii. I assume this location symbolizes joy for you. It sure does for me. In any case, a dream symbol like this, coupled with the bluebird, emphasizes the happiness available to you. It could also mean that you’ll find happiness in Hawaii at the beach. However, dreams are usually symbolic. Nonetheless, since it appeared in your dream, the beach in Hawaii may also point to something real. I believe your Grandma Ellen is a clue to finding your happiness, since, in the dream, you say that the bluebird was her favorite bird. What was she like? Would some of her qualities help you to find happiness in your present circumstances? Did she have a particular saying or a certain view of life that would help you now? Do you believe in an afterlife? Are you willing to consider that your dream is telling you that your Grandma Ellen is helping you out from the Beyond? By the way, I believe our dreams help us to make a better life for us. Therefore, perhaps, based on the message in your dream, you don’t need to work so hard to “figure out” how to make your remaining years more joyful. I know what it’s like to look back at your life and see the mistakes you’ve made. However, maybe, if you acknowledge the happiness there is in your life day-by-day, as time goes by, opportunities for more joy will come along. Your dream seems to be saying it’s available for you and easier than you think. It’s a lovely dream and full of hope. If it were my dream, I’d feel encouraged. I had a dream about two blue birds (actual bluebirds – not a blue jay or robin) landed on the side of my house, outside my window and almost within my reach. In my dream they meant happiness and I remember telling a woman with me that the message was for her and believing it meant babies for her. Minutes later she was killed. After waking, I researched and thought it meant something different. I have this feeling that maybe the happiness they represent to me is just outside of my reach and the fact that there were two meant for me and my young male friend (only friend). He has been seriuosly struggling and his health and financial conditions have drained me to the point of near desperation. I’m hoping that the birds are telling me this is the end of this trying time and that happiness is now within our reach. Please tell me if you believe something different. I really don’t understand about the woman dying. Somehow I’m thinking now that she represented me somehow. If so, does that mean I have lost all hope? Hi Marcie, Thanks for posting your dream. Thanks, especially, for describing the difficult situation in your waking life and the research you’ve been doing to understand this dream. It makes sense to me that the bluebirds represent happiness. There are so many Bluebird of Happiness poems online. Bluebirds must be a universal symbol of happiness to many. However, the bluebirds, and the happiness they symbolize, are not in the room with you, but, as you say, they are out of reach. Nonetheless, they are close. Now, for the most challenging part of your dream: that this woman with you is killed. I assume this woman is not someone you know. Therefore, she likely symbolizes an unknown part of you, and you did say, that it feels as if she represents you. So, let’s look at this symbol of being killed in a dream. On the one hand, you are in a situation that, as I understand it, feels so intolerably desperate that, on a psychological level, it could feel as if, as the saying goes, “It’s killing me.” And, since it sounds as if you’re under so much stress, on a physical level, the situation could potentially affect your health. However, your dream does contain a message of hope. In your dream, you say the message is for the woman and it means babies for her. Babies are usually a wonderfully uplifting symbol in a dream. They often mean a new beginning. Plus, you said the plural babies, just as there were two bluebirds. Lots of potential hope and happiness for you. However, babies need a lot of care. Could it mean the dream is telling you to take really good care of yourself, because this unknown/undiscovered potential within you needs lots of nurturing? Anyway, that’s what it would mean to me if it was my dream.